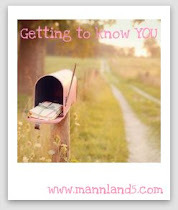 Joining up with Keely over at Mann Land today for Getting to know you. I of course did it vlog style again under pressure from my lovely friend Kate. Again don't mind the messy house behind me and the children in the background. That is how it always sounds and looks around here. Actually it is usually worse.